Harvest Seasonal Grill & Wine Bar needed a responsive website that was user-friendly and incorporated food imagery to further elevate the brand. Elysium Marketing Group created an on-brand, responsive website that allowed their consumers to easily navigate the site and access menus, different locations, store information, etc. Elysium Marketing Group also directed a photo shoot so the website could incorporate images of Harvest’s menu on the site. To ensure the Harvest brand message was conveyed properly, Elysium helped Harvest develop a video that lives on the site’s Our Story page. The Wheel at Steel Pier needed a responsive website using the logo and branding Elysium Marketing Group created for them. Their website needed to showcase the fun and excitement of this brand new Atlantic City attraction. Elysium Marketing Group utilized the fun facts and amazing imagery of The Wheel to create a modern website that embraced the exciting nature of this new attraction. Tony Roni’s needed a new, responsive website that allowed customers to easily navigate the site, incorporated mouth-watering food photography, and looked up-to-date and modern. Elysium Marketing Group directed a photo shoot so Tony Roni’s could showcase their delicious food. Elysium Marketing Group then designed a responsive, modern, and fun website that incorporated Tony’s brand identity and boldness of the Tony Roni’s brand. Beiler’s Doughnuts needed a website that was not only responsive but would also showcase the deliciousness of their doughnuts. Using brand elements from the re-brand they completed, Elysium Marketing Group intertwined gorgeous pictures of actual doughnuts with the doughnut sketches used throughout the brand. Using some interactive features was to key to keeping the site fun. The site’s menu page features an image of each doughnut with the description overlaid on top of the image. The team page has each member toggling back and forth between a picture of each person and their hobby and a picture of each person eating their favorite doughnut. The rest of the site balances a tribute to Beiler’s Lancaster heritage and the fun and excitement of the brand. The Breakwaters had a landing page with minimal copy. They needed a website that spoke to brides and others who were looking to have a special event at the beach. Elysium worked with the Breakwaters team to create a brand new website that easily showcased all that was offered: from wedding options, to the accommodations at the Dunes, to the fine dining at Doc Magrogan's Oyster House. Beautiful beach-y imagery was used to capture the essence of the location. Eventions Productions had an old site and understood it was time to upgrade to a mobile responsive site filled with pictures of their top-rated events. 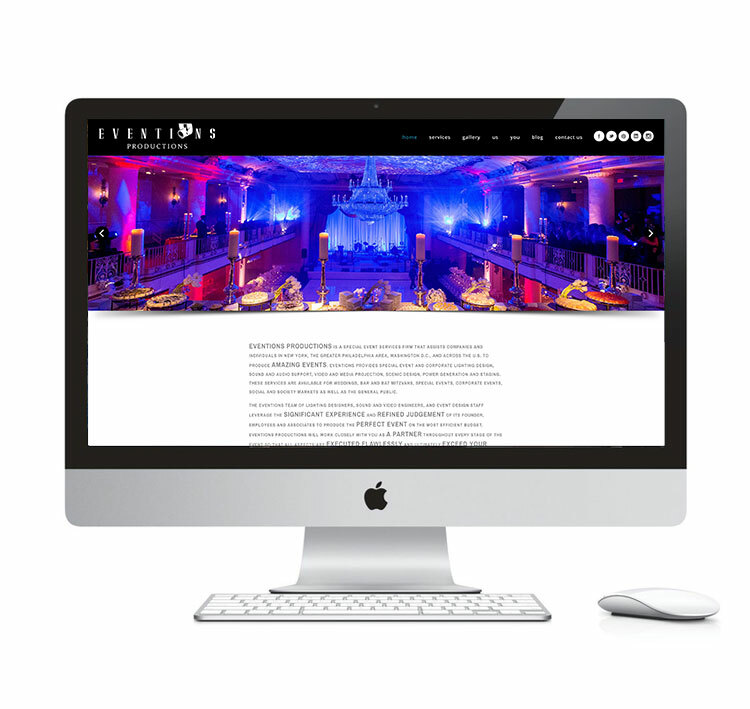 Elysium Marketing Group created a responsive website that let the pictures do a lot of the talking. The cover photo rotated from one amazing photo to another. Elysium set up a photo shoot with a partner photographer that including using triptych photos that showcased each team member's creativity and passion. Lastly, Elysium integrated Evention's social media feeds to encourage visitors to engage with their social media accounts after they visit the site.